Student debt goes up and millennial home ownership goes down. Why? Home/blog/Student debt goes up and millennial home ownership goes down. Why? 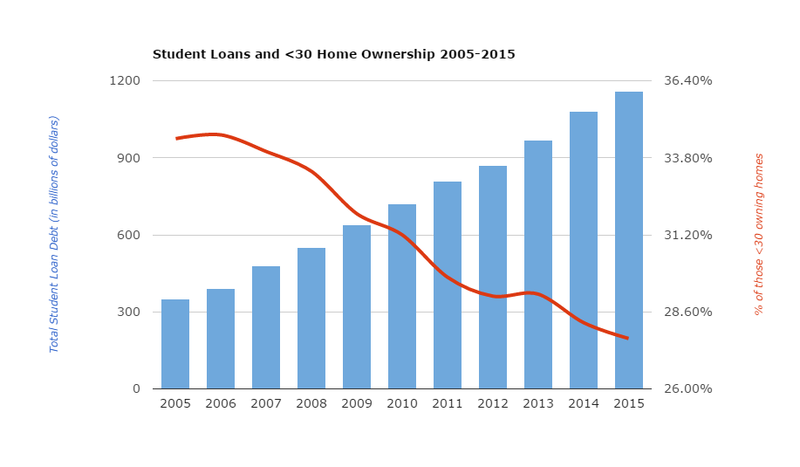 As student debt grows in America, millennial home ownership declines. Why? Imagine paying a mortgage without ever actually owning a home and then being asked if you’d like to buy a home. That’s somewhat akin to the millennial experience with home ownership today. Stuck in student debt ranging in the hundreds to thousands, millennials are looking at debt that accrues interest that leads to other debt and in many cases ends up straight in financial hardship (especially when compounded with the inability to get a job). At Nationwide Student Loan, we’ve seen hundreds of cases just like this. Being able to help people reach financial relief is also a thing we see on a regular basis. Regularly, people accept their situations and either don’t research it or they research it and don’t act upon it. Our advice: talk to us. Let us show you the options that you have at your disposal so that we can help provide you with financial debt relief. Buying a home can be a realistic goal, especially if you tackle your student loan debt today.